Q: Is the pH strip faulty? A: I doubt it. Most commercially bought strips work well and have a long shelf life especially if stored somewhere dark. Q:How accurate are pH strips? A: In science pH strips are used to give a rough indication of the pH. There are really accurate machines used if doing a proper study and these can measure the difference between pH of 6.988 and 6.989 (yes really!). Commercial strips do tend to measure the difference between 1 value like pH 6 and pH 7. This means if you have a pH of 6.5 it may look like 6 or 7 or something in between. In short pH strips are not the most accurate but are accurate enough for many applications. But some pH paper comes in half values too, is that better? A:You can purchase anything you like but really if you just want to use it to test your hair products increments of 1 are fine. Q:So why the different values on the same product? 1. Only substances that can dissolve or consist of water can give you a pH. The slightly more complicated answer is that pH is related to the concentration of charged groups in water (for super geeks - look up hydronium ions). 2. You cannot test the pH of a solid and solids (even tiny little undissolved particles) can interfere with pH testing . This means you cannot just place your conditioner directly onto the strip and expect an accurate result. Hair conditioner is not really a true liquid. You should dissolve it into water (as little water as possible) and then test it. Solids can interact with the paper and give you a false result . However if you have a glycerin/water mix or apple cider vinegar, you can use these direcly as they are solutions. *Top Science Hint - If it is a solution a general rule is that you can see through it because there are no particles. 4. If you need to dissolve something to do your test, use clean glass. Plastic tends to leach into the solution and metal can react with the solution. Clean means washed with soap thoroughly and then rinsed three times in water and allowed to dry naturally. Three is the magic number for scientists. It is enough to show that you made some effort, anything more is welcomed but three is the magic number. 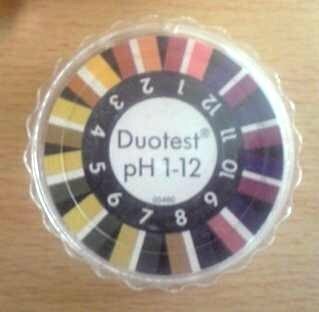 Are you struggling with pH or pH strips? If so, ask a question and I will try and help! Aww Shadelle, no virtual cookies for you then lol. I am glad you learned though! My guess is you can't test the pH of coconut oil because it can't dissolve in water and the pH of hair is based on the thin acid mantle fluid layer covering our strands. heehee ex-science geek here...lets see if i remember any of this stuff correctly; I'm guessing coconut oil doesn't have a ph since oil and water don't mix so you won't be able to form a solution? hmm hair has a ph... is it to do with the proteins in hair being denatured (er not sure if i'm using that word correctly but nevermind) if they're in too acidic/alkali environment? lol Amaka! I think both yourself and J are onto something but I will hold out just a little longer! Goody, goody (clapping my hands when I read the topic of today's post). I loved reading this and I found it very helpful. I rarely use the pH strips I bought last year but recently tested the black soap shampoo I made (after viewing kimmaytubes vid) and it had a pH of 7. Now a question for you: Regarding adding oils to shampoo - since black soap is made with oil and after I diluted the black soap in water, was it a bad thing to add olive and jojoba oil to it? It seems like it cleans my hair/scalp fine (and also moisturizes). Just wondering. . . . This is really good info! It would've saved me a few pH strips, LOL. I cosign with J and Amaka. I think (emphasize think) one can only test the pH of aqueous solutions. With that being the case and coconut oil being hydrophobic, my answer would be no. We can't test the pH of coconut oil. As for the hair question? I'm not too sure. My guess would be to extract the sapienic acid (from our sebum), dissolve it in water, and test the pH of the solution? okay i think i got this right lol. S because of the mantle that surrounds the hair. and the mantle is made up of oil ,salt, and water and that's what give hair it's ph. I've seen it some places called the acid mantle. oh i forgot this part hair isn't actually solid , it's more like a bunch of scales that lie together i guess like a roof or a pinecone whichever you prefer, and so the middle of the hair shaft is just air although some hair strands do have a medulla. Well seems like everyone gets a virtual cookie and a medal because all answers were right or on the right track! A1: Coconut oil is not water based and does not dissolve in water so it cannot have a pH. A2: The pH of hair is obtained by soaking hair in water (deionised water) for about 5 hours and then measuring the pH of the resulting solution. This is all done at room temperature because pH is sensitive to temperature. The water solution obtained by doing this has been shown to contain protein (yes protein! ), trace elements like calcium and potassium and even traces from environment and exposure (for example to smoking). Essentially the pH is testing anything water soluble that can come off from hair (including proteins). This is the reason that pH of hair (and skin) varies so much (between 4.5 to 5.5). People eat differently, clean hair differently and live in different environments. Hello Jc: I am revisiting this post to apologetically retract my earlier comment reading the pH of African Black Soap Shampoo. Another wonderful, natural blogger informed me that her pH reading was higher than what I stated. In my defense, my first purchase of pH strips was from a company named Majestic Mountain Sage. You can purchase 100 strips for $2 USD. I did get a reading of 7 using those strips to test my homemade shampoo (which consisted of African Black Soap, water, aloe vera juice, vegetable glycerin, jojoba oil and olive oil). After hearing about her discovery, I decided to purchase the pH strips sold by Luv Naturals for $15 USD. When I received my order and tested my shampoo, I did indeed get a higher reading. Although aloe vera juice has a pH of around 4, I don’t know how much of it would need to be used to dilute the black soap shampoo for a more hair-friendly pH. I humbly apologize to you and your readers for the misleading comment that I posted. I thought I was using a quality pH strip and getting accurate readings on my shampoo. I have nothing but respect for you and the information that you bring to all of your readers and I knew that I must come back to clarify my false statements. Aww thanks for the update CallaLily. I'm most disappointed in the first company that sold pH strips which were innaccurate. I really appreciate that you commented on it as it will make us all aware. I think the best place to purchase pH strips is from a scientific company like sigma aldrich but for those who do not like online shopping then local pharmacies do tend to carry strips.